It doesn’t matter whether you’re an amateur cook, an enthusiast or a veteran in the kitchen; everyone understands that you need the right cookware to create a mouthwatering meal; a meal that brings life to the table. Regardless of what you’re cooking – even if it’s just scrambled eggs – you’ll always need to have the right pot and pan set to have a tasty meal. 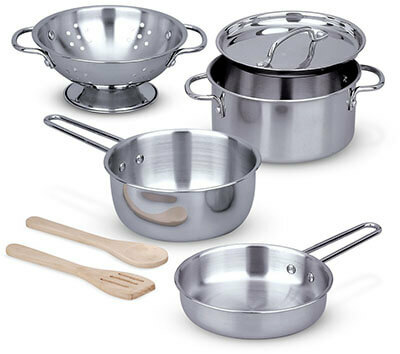 In the past, many people shifted to using nonstick cookware sets though this has recently changed since a larger majority of the population now understands the benefits of using stainless steel pots and pans in preparing their meals. They offer stupendous performance in the kitchen especially due to their durability, scratch resistance, and nonreactive ability. This doesn’t mean that you can just purchase any set. 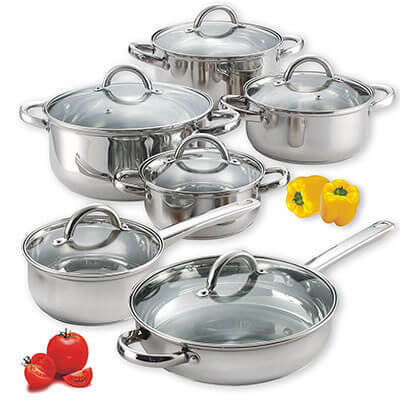 When it comes to buying, you need to find the best stainless steel pots and pans available in the market. We’ve helped make the work easier for you, fortunately. 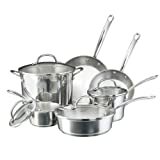 This list gives you reviews of the best stainless steel cookware set you’ll surely want to consider. If you can’t go for a cookware set that a professional chef would enjoy using because you’re on tight funds, then you can comfortably settle with Cook N Home’s 12-Piece pot and pan set. It has a very budget friendly price tag and will work just as perfectly as other high-end models. 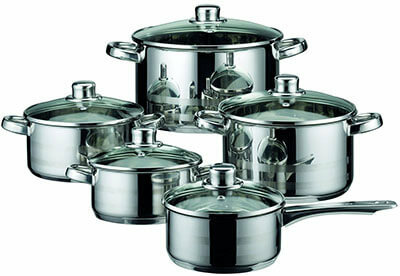 This mirror-polished set has a capsulated bottom that allows for even heat distribution. Its stainless steel body makes it perfect for all cooking surfaces. What’s more the stainless handle rivet ensures product durability while the tempered glass lid provides you with a clear view of your food when cooking. 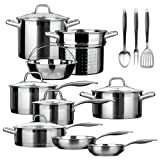 Chef’s Star 17-piece set is made with a commercial grade stainless steel making it highly durable and long-lasting. It equally has an encapsulated bottom with impact bonded aluminum. The cookware set additionally features handles that are ergonomically shaped making them very comfortable to use. What’s more these handles are riveted to the pan and additionally have an anti-slip satin finish making them even more durable. You can use this set for all cooking sources whether it’s a stove or cooktops. They are both oven and dishwasher safe, and you can even store them with food in your freezer. The set includes frying pans, a boiler basket, 2-prong fork and a slotted spatula among others. You’ll truly love Calphalon’s Classic 10-piece cookware set that makes cooking fun and fast. The set, aside from being made from brushed stainless steel, has an impact-boned aluminum base for fast heating. The pots and pans have imprinted marks making measurements pretty easy. Besides, they also have tempered glass covers made with straining holes that come in handy whenever you want to drain any liquid. It is durable, and versatile design makes it the best stainless steel cookware set able to stand up daily use for a long time. That handles are conversely long enough to let you stay comfortable when cooking. They are additionally broiler, oven, and dishwasher safe. This classic set of stainless steel cookware is even protected by the company’s 10-year warranty to allow you peace of mind when you buy. This is a 10-piece stainless steel set by Cuisinart meant to provide optimal cooking performance and make you prepare finger-licking meals. Made with nearly everything any home chef needs, the Classic Stainless Steel set is ideal for any large family or a serious, enthusiastic chef looking to take their cooking skills to the next level. It features a cast Cool Grip stick handle that is contoured to give you a secure grip. The set further has glass lids designed with wide easy-grip handles that fit tightly to ensure an even faster cooking while equally locking in your food’s flavor. 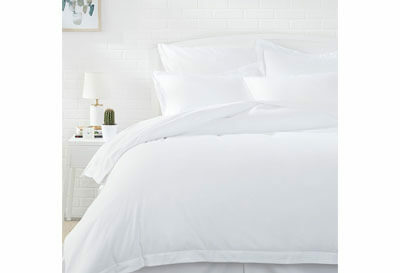 It has tapered rims that make pouring clean and easy. The side grips and helper handles are riveted designed to make it easy to transfer from the stovetop to the countertop. 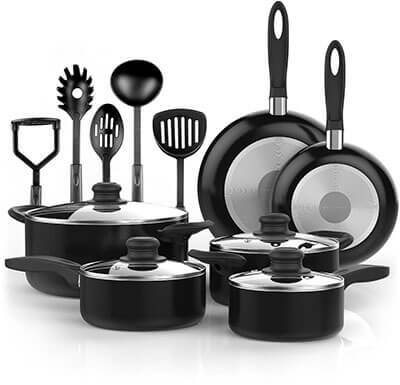 This black cookware set by Vremi has a very reasonable price and is perfect for anyone working on a tight budget. 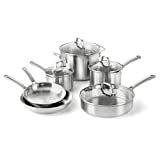 It is the essential kitchen starter set featuring five nonstick cooking utensils and six nonstick pots and pans. The Dutch ovens and saucepans have glass lids while the small fry pan, Dutch oven, and mini saucepan make a perfect cookware set for camping due to their size. Vremi’s black set has cooking utensils that are dishwasher safe though hand washing is highly recommended for the cookware. They are also oven safe and feature cool-touch ergonomic handles that help make cooking even more comfortable, safe and fun. 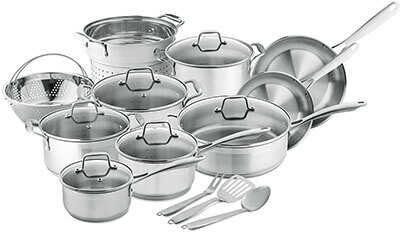 Among the best cookware sets made of stainless steel is the ELO Skyline 10-piece pot and pan set. 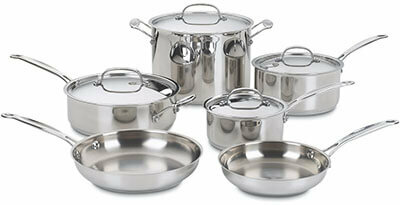 This German engineered top-notch cookware is made of 18/10 polished high-gloss stainless steel. The lids also feature stainless steel rim and transparent glass designed with a ventilated air vent. The capsulated bottom allows for even heat distribution while the ergonomic handles make them very comfortable and easy to use. This product comes with a money-back guarantee no need to worry if you want the set. The silver touch finish on this stainless steel set gives the pots and pans an elegant look they’ll surely add class to your kitchen. The set is also affordable thus you won’t have to dig very deep in your pocket. 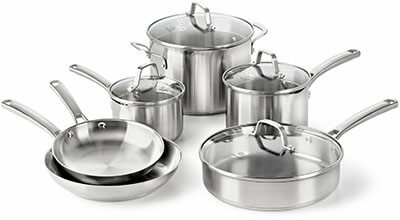 This is a 10-piece set that includes sauté pans, sauce pans, Dutch oven, a spoon and slotted turner. The curved riveted stainless steel handles are ergonomically designed making them comfortable to use, and they also stay very cool even when cooking is ongoing. Their glass lids feature loop handles also made of stainless steel that helps trap in nutrients and heat. The Stainless Steel Pretend Play Kitchen Set has pots and pans of large sizes to give them a more realistic look and feel. 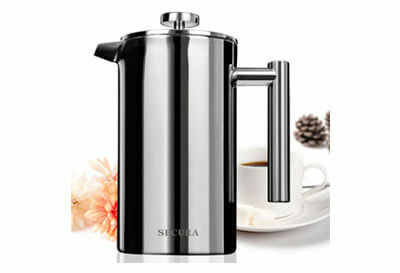 This product ranks as the best seller due to its stainless steel design that makes it the envy of all even grownups. It is ideal for kids aged three years and above. The three pans and the colander will fit your kids play food items quite perfectly to give them an exciting kitchen play time. 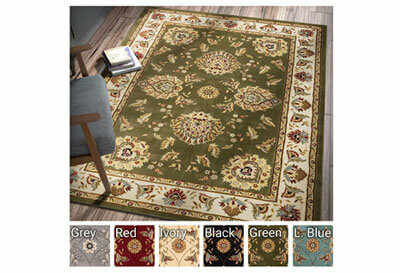 Besides, the handles have sturdy riveted joints making them extremely durable. Along with the polished stainless steel pieces, are two hardwood utensils additionally meant to give your upcoming chef a fun time in the kitchen. This cookware set includes ten pieces that meet the North American Electrical Standards. It has a Prometal Pro non-stick interior that is scratch resistant and highly durable you can use it with a metal utensil. 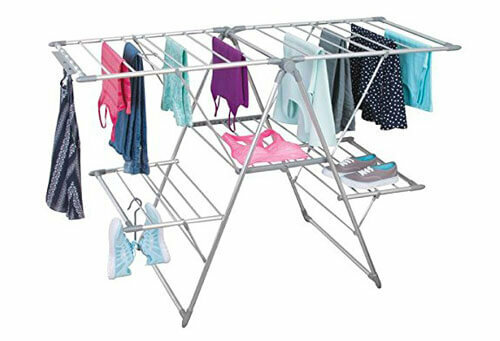 Moreover, its exterior is equally made of nonstick material making it pretty easy to clean. It is dishwasher safe and features a unique Thermospot heat indicator that shows you when the pan is perfectly preheated. It is additionally safe for all cooking methods. The riveted silicone handles allow for a comfortable grip and will stay cool even when cooking on high heat. The set has a three layer bonded construction with a layer of thick aluminum core fit between them. This remarkable assembly helps eliminate hotspots and ensures there’s even heat across the bottom and up the sides. 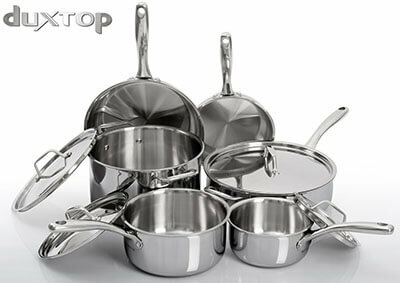 This Clad bonding technology sets the Duxtop Whole-Clad Tri-Ply apart from other stainless steel pots and pans. Furthermore, this technology extends the cookware lifetime as opposed to other models available in the market. Other additional features include ergonomic riveted stay-cool handles, stainless steel lids designed with loop handles and drip-free pouring rims. 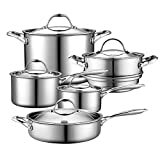 If you’re a regular cook at home, you need to have the best stainless steel cookware set made of high-quality, durable material to prepare any meal you want. While you may feel that you’re on a tight budget and prefer cheap cookware sets, they may not perform as well as other top brands. However, these stainless steel pots and pans will provide you the best of both worlds: excellent performance and affordability you won’t have to break the bank to get one. If you want to cook like a pro, then it is time you considered shopping like a pro and make an ultimate decision using this top 10 list.